Snow accumulations are predicted to stay within 2 to 4 inches, along with a trace of ice before turning to rain. According to The National Weather Service, a Winter Weather Advisory will remain in effect from 1 PM this afternoon until tomorrow, Sunday morning. 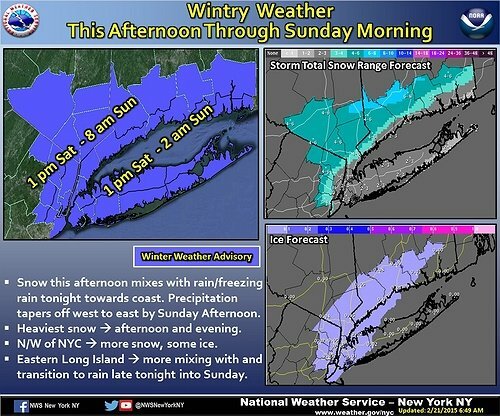 Long Island, New York City, Portions of Northeast New Jersey, and parts of Central and Southeastern Connecticut will all be experiencing snow and freezing rain. Snowfall will occur this afternoon into this evening then switch to a mixture of snow and freezing rain this evening. By the morning conditions will change to just rain. Snow accumulations are predicted to stay within 2 to 4 inches, along with a trace of ice. Visibility will be one quarter to one half a mile at times with roads covered in snow and coated in ice making driving conditions and walking conditions potentially hazardous. Winter Fun, Honoring MLK, News & More inJanuary 18th's Newsletter! Subject: LongIsland.com - Your Name sent you Article details of "Winter Weather Advisory in Effect for Wintery Mix This Weekend"